Windows 10 Pro 64-bit, 10.1inch screen, 2K Resolution Display, Rugged-IP65, Military spec'd MIL-STD-810G, ATEX / IECEX / Class 1 Division 2, Bluetooth 4.2 (EDR + BLE), RFID-NFC, platform offers a variety of tablet configurations and a shared accessory ecosystem that sets a new standard in office, vehicle, and field-based computing. Building the perfect mobility solution for your most critical business applications is easy with the versatile L10. These extremely rugged 10.1” Windows® tablets can be custom-configured to satisfy many different enterprise computing requirements and budgets. 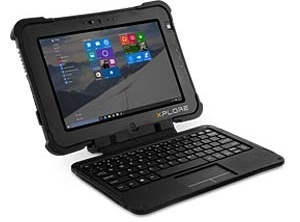 Whether your mobile workers prefer a slate tablet, a tablet with a hard-handle and built-in barcode reader option, or a 2-in-1 laptop / tablet with a full-featured keyboard, the functional flexibility of the Xplore L10 ensures that your workers have the right computing tool for their job. Only Xplore offers this many performance, security, connectivity, and accessory options in one rugged mobile computer platform. Xplore L10 is the best way to get the exact mobile computing solution you need to keep up with growing business demands and quickly respond to evolving customer demands. It is also the best investment you can make today for a stable, reliable mobility platform that will give you more rugged protection, reliable connectivity, security, and long-term scalability for every dollar spent. Xplore L10 platform is stronger than its predecessors and more resilient than its competitors. The L10 platform offers three dustproof and waterproof mobile computers, each of which sets a new Xplore record in the 10.1” tablet category with a 6 ft. (1.8 m) drop rating and an extreme temperature tolerance that ranges from -4 F to 140 F (-20 C to 60 C) while operating and -22 F to 158 F (-30 C to 70 C) while stored. The extreme durability of the L10’s unique magnesium frame, rubber bumpers, Gorilla® Glass-protected display, and sealed I/O ports has been tested to strict MIL-STD-810G standards for vibration, shock, humidity, and more. It is also C1D2 certified 3 for safe use around explosive gasses and fine dusts in Hazardous Locations. We are giving you more CPU options than ever to guarantee the performance-driven Xplore L10 rugged tablet platform will be the right fit for your business applications and your budget, including three different 8th Generation Intel Core™-Series processors and an Intel Pentium®-series processor. Add a PCIe solid-state drive (SSD) for an extra speed boost 4. The Xplore L10 platform is also available with up to 16 GB RAM and 1 TB storage for the most data-intensive business applications. The Industrial Dock combines the L10 Vehicle Cradle and a sturdy desk stand to hold your Xplore rugged tablet in place. Perfect for touch applications in the plant, warehouse, or office. The dock provides power to the tablet and has two USB ports for expanded connectivity. Add on an optional 4K port replicator to gain four USB 3.0 and 2 USB 2.0 ports, DVI, DisplayPort or HDMI, Gigabit Ethernet, microphone in, Stereo speaker out, and security lock slot. Submitting reports from the vehicle or job site is a snap with this full travel, tactile feedback, spill-resistant tablet keyboard. The touchpad supports two-finger and three-finger gestures. The Companion Keyboard closes over the display glass like a laptop. When it’s time to snap your Xplore tablet into a dock, the keyboard detaches easily. This combined Kickstand and Rotating Hand Strap provides working comfort for all Xplore L10 rugged tablet models in the field and at a desk. The integrated Kickstand closes tightly when workers are on the move, enabling access to the Rotating Hand Strap, which can be adjusted for hand size as well as unique rotation angle. The Extended Life Battery is ideal for workers who are in the field for long periods of time, or for rugged tablets utilized around-the-clock for shift work. It powers L10 rugged tablets up to 27 hours on a single charge. This battery pack attaches to the tablet using the battery bracket kickstand.